Oh, look. A tray of raw beef garnished with… a sprig of juniper for some reason? Who eats raw beef with juniper? What the hell is going on here? 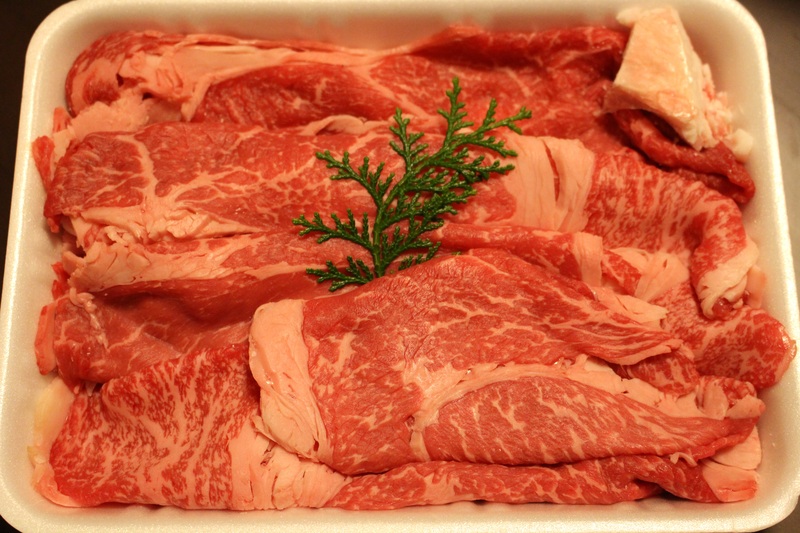 Less than two years ago, laboratory-grown beef made a big splash in the news. The scientists who grew the first hamburger not carved from the flank of a steer munched on quarter-pound burgers that were also quarter-million-dollar burgers, and pronounced them, if not the most delicious ever, acceptably beefy. The burgers, at that cost, were a curiosity at best. But the price of growing meat by the cell has been dropping steadily and sharply since then. The same quarter-pound patty now costs about ten bucks to grow. At this rate, we may see commercially viable laboratory-gown meat very soon (one expert says twenty years, this writer hopes for much sooner)—and that means you’ll be seeing it in your grocery store by-and-by. It will be up to the consumers to decide whether or not they want to eat something grown in a lab as opposed to carved out of an animal. Many meat-eaters are skeptical of the idea, but on the other hand, there are a lot of current vegetarians and even carnivores who are skeptical about the level of cruelty involved in factory farms. Personally (I’m a meat-eater), I’ll take the laboratory. Look at it from the cow’s point of view: would you rather have a muscle biopsy so a bunch of people can eat food grown from a few of your cells, or be carved apart with knives and saws and consumed directly? I know which I’d prefer. Also, producing animal flesh in a lab involves a whole lot less water consumption than raising an animal the traditional way, it certainly means less grain going to animal feed rather than feeding hungry humans, and, of course, there’s WAY less animal poop to dispose of. That sounds like a joke, but it’s really not. Have you ever heard of a ‘livestock waste lagoon’? Yes, lagoon. As in, enormous pool of rotting poop that covers several acres, causes various contamination problems, and nobody really knows how to deal with. Yuck. Those are all important concerns, and all good reasons to look forward to getting our meat out of the laboratory rather than off the hoof. But, as usual, there’s more here than meets the eye. There’s the potential to do a whole lot of things with meat that are impractical, impossible, or even illegal to do with meat as we know it now. At present, most people in the USA eat beef, pork, chicken, shrimp, and a few basic fish like tuna and salmon and whiting. Even less-popular meats like lamb can be hard to come by and pricey, because a grocery store has to buy large ‘primal cuts,’ whole portions of an animal, for sale—and that means waste for an unpopular meat: low demand and a requirement to take on a large supply if they want to offer it. But if it’s grown in the lab, grocery stores have the opportunity to order only what they need, and to order small batches of less common meats to see if consumers are interested in trying them out. The supplier to the store isn’t slaughtering a large animal, they’re growing to order as well. And that means variety becomes easier to offer. Have you ever thought of trying game meats, like caribou or wild boar? You won’t find either in the supermarket. You can order them online—if you don’t mind paying fifty bucks or more per pound. You’ve noticed, of course, that bigger shrimp cost more—but if you’re just growing shrimp tissue, there’s no reason you couldn’t just grow it in any size you wanted, for the same price per pound. Imagine picking up a 3-lb chub of solid shrimp, and slicing it into easy-to-sear shrimp patties for the grill. Or quarter-pound chunks in the familiar comma shape. Family size scallops—one to a pie plate. Any meat you’d like, grown in sheets like pie dough, so you can enclose other food with it. Great for Thanksgiving—individual turkey and stuffing pockets! Make a turducken as easily as folding a pillowcase. Or think of delicious shepherd’s pie made in a ‘pie crust’ composed entirely of tender, succulent beef. Eat quail and trout without having to pick out a million little bones. 3-D dinosaur-shaped chicken nuggets for the kids. Like, one that could stand up on the plate like a regular action figure. 3-D dinosaur-shaped dinosaur nuggets for the kids—just need to find a few cells in amber, Jurassic Park style. This one might be a bit of a long shot, but it’s fun to dream, isn’t it? Lab-grown meat is coming. It has the potential to eliminate the enormous loads that raising animals for consumption places on the environment in terms of demands for water, land, feed, and disposal of waste. And it also has the potential to allow people to indulge in a wider range of culinary exploration than ever before—and no dead animals (or people, for the cannibals in the audience) to show for it.